Last weekend our Friday night DM surprised us with a fantastic pair of maps made from Terraclips and D&D tiles for our campaign finale. I had never heard or seen these strange tile-and-clip things, so I asked him about it. I was also surprised by how sturdy the structure was – he picked it up with one hand and swung it around like a solid piece of cardboard. I was uncertain but by the end of the night I was more curious about the tiles was interested in finding out more. The following day I researched Terraclips online, including watching their videos and reading their forums. By the time my husband got home from work I was feeling like giving them a try. I showed the same videos to him and he was also impressed. The next day we swooped up a lucky catch: all three available sets at our local game store! If you plan on buying some of these – do watch the videos. They are full of truth. I’ll repeat one thing they say for emphasis: the clips do not come in the tile boxes. You have to purchase them separately. The videos recommend purchasing one box of clips per box of tiles – which is what I did. Now I’m going to make my own recommendation: think first, then buy. If you’re going to use your Terraclip tiles to make small encounter-sized maps for your groups then you can probably get away with one box even if you get two or three tile sets. 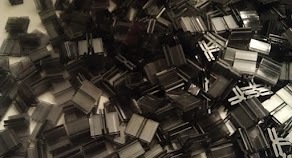 If you’re planning on using more tiles, making medium to large layouts, possibly sprawling complexes covering your table, then yes a box of clips per tile box is appropriate. It took me nearly 45 minutes to finish unboxing my first set (and I haven’t had the energy to sit down and unbox the other two yet!). I’m not going to give an exhaustive list – you can get that on the website. 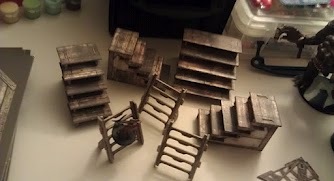 Besides a generous supply of floor, wall, and roof tiles, the set includes four stair sets: three 2” stairs and one 4” stair. It also included three ladders. I noticed the ladders had interesting notches on each rung and realised they were intentional – you can seat a mini on one of the rungs and it won’t fall off! Genius! The box is large and hefty. 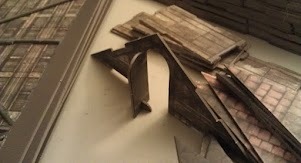 Inside the Buildings box was 16 sheets of die-cut cardstock. 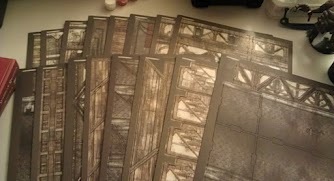 The cardstock is about as thick as D&D tiles, but feels a little bit denser to me. 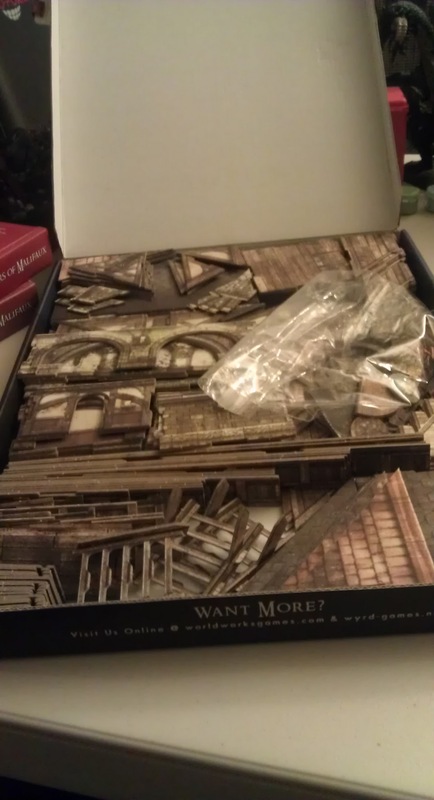 The die-cutting is excellent and they clearly tried to use as much space as possible, filling even archways and nooks with extra tokens and bits. The cuts are clean and the pieces pop out easily but you do still need to pay attention to any tile with small cuts – like the doors and the ladders – where the paper can tear. I did slightly tear the printed layer on one door when I carelessly tugged it the wrong way. The artwork is top-notch. In the Buildings box you get a mix of wooden and stone floors, a mix of wood & plaster walls and stone walls, and clay versus wood roofing tiles. There is an excellent level of attention to detail on every tile. These aren’t simply shaped tiles with generic textures slapped onto them. Each tile has something unique about it. Walls have drapes, half-melted candles, cracked plaster, shutters, etc. Floors have different planking or stone work, mold, occasional rugs scattered about, trap doors are placed suggestively but are also subtle enough you can effectively ignore them if appropriate. The color palate is consistent and seems to match well with the other two sets – I can see using all three sets on the same layout and not have that jarring effect you sometimes get with D&D tiles from different series. The box is ideal for storage. A single baggie holds all my tiny pieces, the rest stack up neatly in the box. Note: the ladders have very snug slots and you may want to leave them assembled instead of risking tearing them by disassembling and reassembling them. Thankfully, the box is just high enough you can lay the ladders down inside the box and close it without crushing the ladders. The stairs are easily dissembled without problem and stored flat. 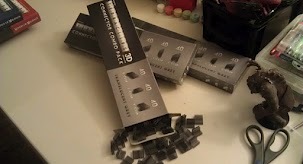 The clips are already loose and require no prep – open box and pour out. I’m storing mine in their boxes as-is because boxes stay neatly on my shelf versus bags or a different storage bin. All the tiles have small notches on them. They might seem intrusive, but once things are in place you won’t even notice them. The plastic clips are designed to bring the edges of the tiles together snugly. The clips themselves are also more unassuming than you’d think. On the walls you really won’t be bothered by them, and on floors they’re only slightly intrusive – they did not prevent our minis from occupying the same squares but they are *there* and that might bother some people. The videos recommend having a plan before you sit down to build. This is sound advice. 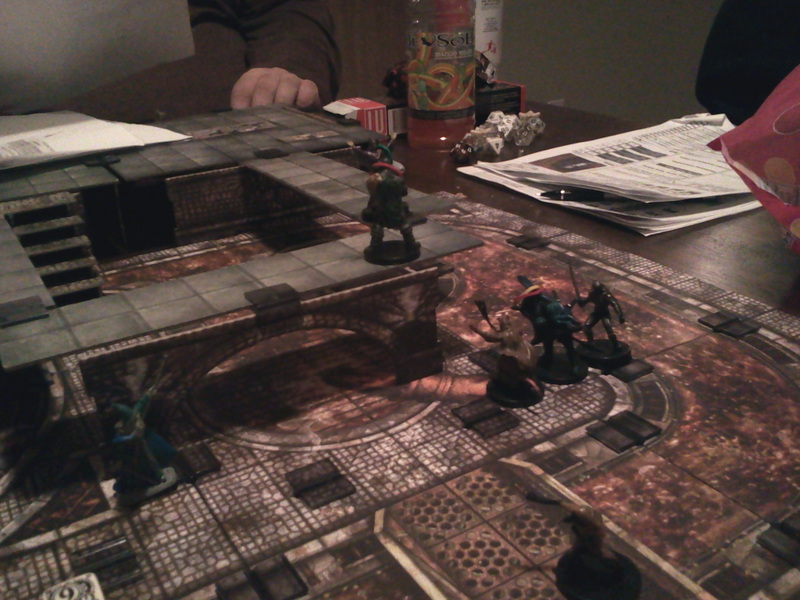 With my D&D tiles I can sit down and tool around with tiles until something strikes me. 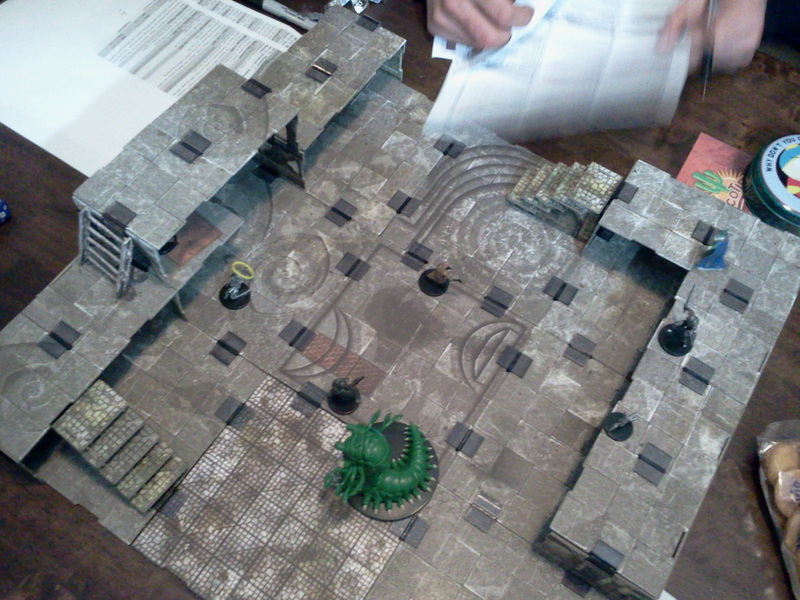 The D&D 3D tiles are few in number and are basically simple accents to your 2D map. The Terraclip tiles are specifically 3D tiles with a handful of foundation tiles. Because you don’t have an infinite amount of tiles you have to think about what you want to build. Other than that, its really just as simple as Legos – think of what you want to put here, find piece, clip into place. One really fun aspect of the Terraclips is the stacking. The clips have small ridges in them so that when you build up levels, you don’t actually clip the levels together. The ridges rest naturally on the top edges of wall tiles, making it sturdy enough to stand on its own but as easy to lift off as a lid on a pot. Unstack to access every inch of your map without interrupting your game. Feel free to experiment: I took a piece of railing that would normally be placed vertically on the edge of a balcony and instead placed it horizontally along a wall to create a narrow shelf. 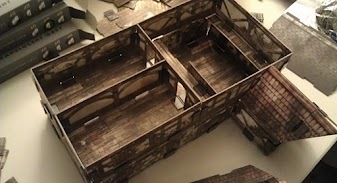 My friend used the clips to combine Terraclip tiles with D&D tiles to create a larger network of catwalks over a sewer system. 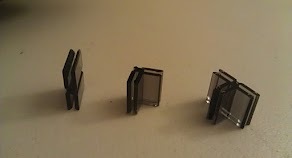 The clips will grip D&D tiles, although the result is not as neat looking as the Terraclip tiles because D&D tiles do not have the built-in notch that makes the joints look smooth and evenly joined. 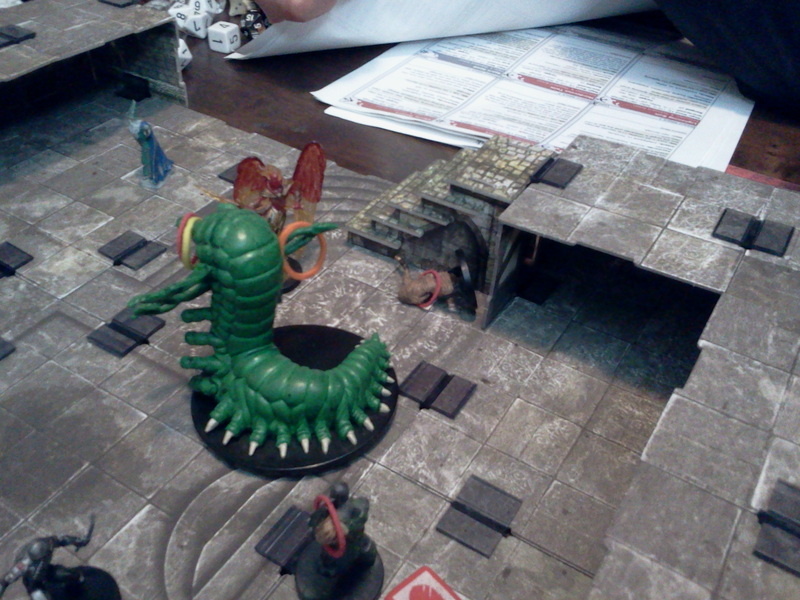 Heavy usage might damage the D&D tiles, so be careful when applying and removing clips. 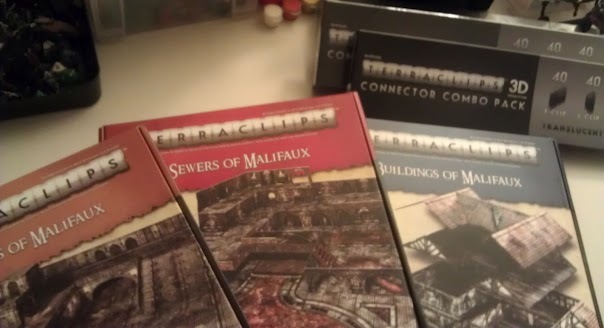 Terraclips tiles were $49 each at my local store, and $18 per box of clips – making that an investment of $67 just for one working set. On one hand, yes that’s a bit pricey, but on the other hand you do not get ripped-off for dropping big bucks on the set – you’re given an ample amount of quality product for your purchase. Now if your group spends very little time in an urban setting then of course you’ll want to skip these. If you’ve never in your life enjoyed Legos or some other adolescent building toy, then you’ll also want to skip these. 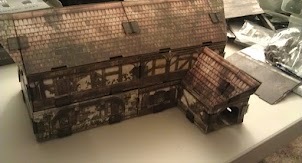 If you liked D&D 3D tiles but feel they were a little underwhelming, if you use regular tiles or poster maps but wish they were more immersive, or if you simply enjoy any sort of 3D terrain I recommend you give these a try. I highly recommend them if your group enjoys rich urban settings and you could see yourself making their favorite inn, the local mansion, or ambush alley. If you’re positive you’ll build entire layouts of streets, sewers, and buildings: for DMs like you it may be worth it to get two or more sets. 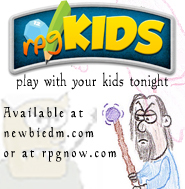 ← 1st Ed D&D reprints are coming! Oh wow. That is some complex stuff right there. I never was big on using the grids in my games in 3.0 and 3.5 because I felt like it made players metagame too much and focus more on power leveling than anything else. I’ve come around to it though in 4.0. I really love the grids. Had no idea they made things like this thought. That’s awesome. Yep. 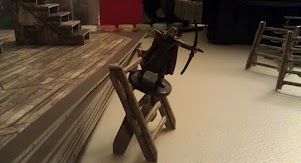 Terraclips isn’t even made for D&D specifically, it was made for the skirmish game Malifaux, but we’ve been using them regularly now in our Friday night games. subject but I simply needed to ask. Thanks!